“Didn’t they (BJP) form a government with Mehbooba Mufti in Kashmir? Didn’t they release the stone-pelters? Weren’t they the ones who released Masood Azhar in the past?” ask Raghunath Singh, a middle-aged farmer. “I HAVE never voted for the cycle. But there is an alliance this time, so I will vote for it,” says Ravindra, a middle-aged man running a cycle-repair shop near a temple at Khaditpul in Jasrana assembly segment of Firozabad Lok Sabha seat in UP. Ravindra belongs to the Jatav community, the core support base of Mayawati’s BSP which was the arch rival of Akhilesh Yadav’s SP in the state till they formed a poll alliance last year. But as Ravindra’s choice indicates, there is no confusion among this community in Firozabad, and across Aligarh, Hathras, Fatehpur Sikri, Mathura and Etah. Cutting through this swathe in western UP, which goes to vote in the second phase on April 18, there is no confusion either for the other bulwark of the UP gathbandhan — the Yadav community that is the SP’s backbone. Except in Firozabad, where many of them find themselves in the middle of a family feud, between Akhilesh Yadav and his uncle Shivpal Yadav. Here, Akhilesh’s cousin Akshay Yadav is pitted against Shivpal himself. Amid these multiple strands, one binding factor is their anger against the BJP governments in the state and Centre. “Milk prices have crashed. We are outcasts in this Modi-Yogi government,” says Ram Kumar Yadav, in his early 30s, from Toli village along the GT Road in Hathras Lok Sabha constituency. “I voted for BJP during the ‘Modi wave’ in 2014 but I won’t this time,” he says. But it’s not so straightforward for the third pillar that the SP-BSP gathbandhan is leaning on in this region — the influential Jat community of mostly farmers that Ajit Singh’s RLD draws support from. 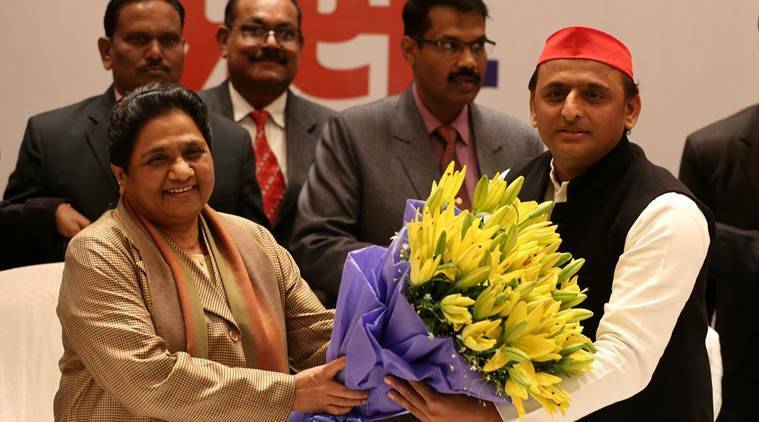 In the alliance, the RLD is contesting in three of the 80 Lok Sabha seats in politically crucial UP with BSP contesting in 38 and SP in 37. And Jats constitute a sizeable section of the electorate across western UP — Fatehpur Sikri, Mathura, Aligarh, Hathras, Bulandshahar, Ghaziabad, Gautam Buddh Nagar, Baghpat, Kairana, Muzaffarnagar, Meerut, Amroha, Bijnor, Nagina and Saharanpur. Take the case of Zikarpur village in the Aligarh Lok Sabha constituency. It hit the headlines in 2010 after three farmers were killed during a protest over land acquisition for the Yamuna Expressway Industrial Development Authority (YEIDA) during the Mayawati-led BSP government. “Crop prices are not good. The BJP government has amplified Hindu-Muslim polarisation. Their government is spreading intolerance,” says Devdutt Singh, a middle-age Jat farmer, who is visiting a neighbour’s house. Singh is interrupted by other community members who start mimicking the best Opposition speeches in Parliament during the last five years. Soon, they declare their support for the BSP candidate from Aligarh. Outside the village, another group of Jat farmers is playing cards in the shadow of an underpass below the Yamuna Expressway. They strike a different note. Most declare their support for the BJP, except for two who are backing the Congress candidate who was an MP from Aligarh in 2004-09. There’s a similar dissonance among the community in Kurana village, a few kilometres away in Aligarh constituency, and through to villages in the adjacent Mathura Lok Sabha seat. In the Mant assembly segment under Mathura, the sentiment among Jats is in favour of the RLD candidate. But again, a heated exchange at a seed shop in the Jengara village market in Fatehpur Sikri reveals the lack of cohesion. Raghunath is voting for BJP candidate Rajkumar Chahar, a fellow Jat. But he is also quick to rebut another farmer at the shop who is voting for the BJP “because of the good work done by the government under Narendra Modi and the bold decisions taken by him”. Both say they voted for the “Modi wave” in 2014, and agree to disagree on the reasons for their choice this time. There is no such confusion among a similar group at the Kanka crossing in the Iglas assembly segment of Hathras Lok Sabha constituency. “What can RLD do with three seats? What will SP-BSP do after 2019? They have to part ways anyway. Mayawati can’t even speak without a piece of paper to read from,” fumes Ghure Singh, an elderly farmer. They are clear that Ajit Singh’s RLD will not have much influence over their voting preference. It’s a similar track among Jats in Bijnor, as well. “With three seats, RLD will be last in the queue of any alliance. It’s in alliance with the wrong group,” says Madan Pal, an elderly farmer at Bawapura in Chandpur assembly segment of Bijnor Lok Sabha seat, as the group with him is quick to agree.